I love cheese. Almost any cheese but especially brie. The creaminess, the richness, the melty goodness when it’s baked – it’s all good. When our neighbors asked us over for drinks, I offered to bring an appetizer and chose this cranberry pistachio baked brie. I always have cranberry sauce, whole berry or jellied, in my pantry so I concocted this appetizer. Sugar helps cut the tartness of the cranberries while the orange zest adds a mild, citrusy zing. The pistachios, which are usually always in my pantry too, offer a slight crunch giving the dish texture with the creaminess. If you’re not a fan of pistachios, you could use whole almonds, unsalted, and chop the same amount. If there is a nut allergy you are concerned about, just omit them. This is week 16 in the 52 Week New Recipe Challenge. As you can see in the photo I have a brie baker. I make baked brie of some kind quite a bit and often experimenting. While the recipe calls for a pie dish, you could bake on a parchment lined baking sheet, however, moving soft, baked brie is tricky without it oozing out. You need a spatula large enough to move the brie and thin enough to slide under it. If it’s already oozing when you remove it from the oven, you risk losing much of that creamy goodness. A pie plate is a better option, or a small 1 1/2 quart Corning ware dish. Anything that’s ovenproof. Place the sauce, sugar, and zest in a saucepan over high heat. Stir to dissolve the sugar and bring to a boil. Reduce heat to simmer and cook, stirring occasionally, for 10 minutes or until sugar is completely dissolved. Remove from heat. Preheat oven to 350 degrees F. Place the brie in an 8-inch pie plate. Bake at 350 degrees F for 10 minutes or until the brie is soft to the touch. 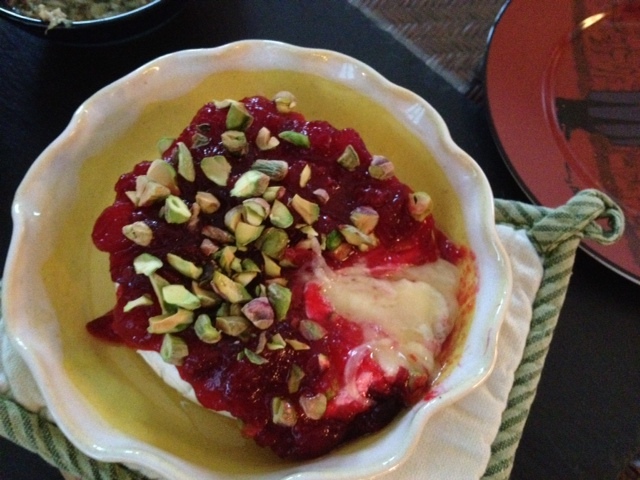 Remove the brie from the oven and top with the cranberry sauce and sprinkle with the chopped pistachios and orange zest. Serve immediately with crackers, pita chips, sliced baguette or crostini. This entry was posted in 52 Week Challenge, Appetizers, Company Worthy, Entertaining, Holidays and tagged Appetizers, Baked Brie, Cheese Appetizer, Cranberry, crostini, Pistachio, pita chips. Bookmark the permalink. A baked brie is one of my favorite things to serve when I have a party. And there are so many ways to top them, from sweet to savory. Yours looks fabulous and festive!